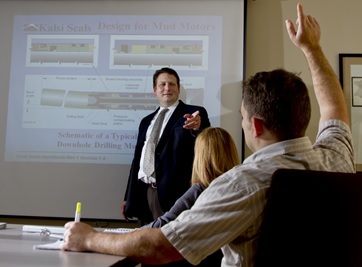 An Invitation to Our Seal Customers - Kalsi Engineering, Inc.
Kalsi Engineering offers two different seal-related training classes. One class focuses on helping engineers design Kalsi Seals into a rotary shaft seal assembly. The other class is for shop technicians, and focuses on the assembly and disassembly of equipment that incorporates Kalsi Seals. Kalsi Engineering invites our customers to stop by our Sugar Land, Texas office to tour our facilities, and meet the engineers at the forefront of polymeric high-pressure rotary sealing technology. Learn directly from them about the most recent advances in high-pressure rotary seals, and the best ways to incorporate them into your rotary shaft seal assembly. To schedule a visit, call 281-240-6500, or send us an e-mail. We appreciate your business, and look forward to seeing you. While you are here, you may want to take one of our seal-related engineering or shop training classes, which are available at no charge. The engineering training class is based on our rotary seal handbook, and lasts about 3-1/2 hours. (The time may vary, depending on the group size and the number of questions.) The primary focus of the engineering class is the critical aspects of implementing Kalsi Seals in a rotary shaft seal assembly. The course can be usually tailored to the type of equipment you have, whether it be mud motors, rotary control devices (RCDs), rotary steerable tools, high pressure swivels, or some other type of rotary shaft seal assembly. Our shop training class identifies things shop technicians should look for while disassembling equipment, and highlights good assembly practices. It also provides a general introduction to Kalsi Seals, and how they work. The duration of the shop training class is about 45 minutes. We would also like to show you our extra wide enhanced lubrication seal product line, so you can understand why these amazing seals are so capable in high pressure rotary equipment, such as RCDs. Check out the test data from the fixture we built to evaluate full-size RCD seals in high pressure operating conditions. Then check out our plastic lined seals, which have even more pressure capacity than the all-elastomer extra wide seals. We can show you a pair of 2.75” seals that ran at 7,500 psi for 1,000 hours, and are still in good shape. We can also show you used 10.50” seals that were tested for 200 hours at 2,300 psi and 100 rpm, while mounted in conventional non-floating seal carriers. What other seal manufacturer tests full size RCD seals? We can also show you the KLS® and BRDP seals we developed especially for lower cost rotary heads. Unlike our enhanced lubrication seal product line, these new seal designs do not require lubricant overpressure systems. We are also excited to tell you about our continuing advances in hardware implementations that dramatically enhance high pressure rotary seal performance by minimizing extrusion gap clearance. Recent patent-pending improvements include geometry innovations that accommodate smaller extrusion gaps by providing improved torsional stability, composite construction that reduces dimensional changes related to temperature and pressure, and force-balancing seal enhancements that reduce friction and increase pressure capacity. We are eager to explain how these advances can improve seal performance in your rotary shaft seal assembly.